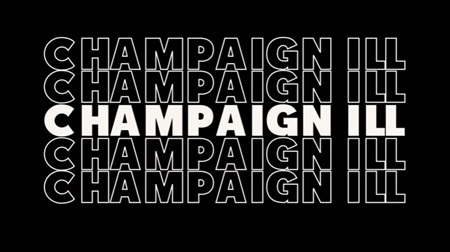 A few weeks after eyebrows raised and hackles sounded in various corners of Champaign County and the Webisphere when a trailer first made the rounds, YouTube Premium released 10 episodes of the new series CHAMPAIGN ILL on Wednesday, December 12. 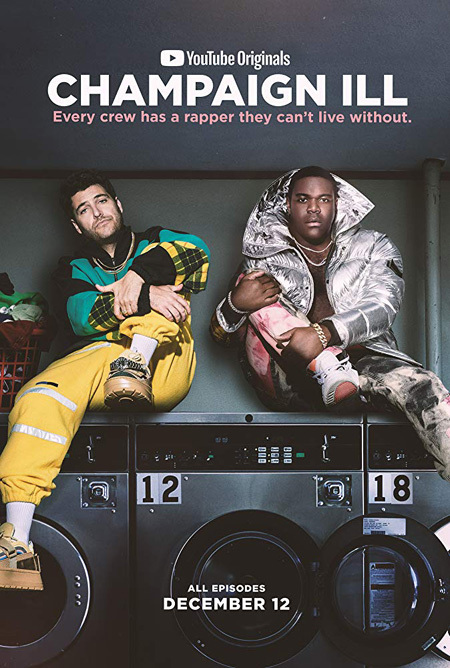 In this sharp-tongued comedy of errors with more heart and gumption than can be gleaned from that preview, Ron (Adam Pally, THE MINDY PROJECT) and Alfonso (Sam Richardson, VEEP) are entourage members of a successful rap artist stage-named “IL Lou the Sickest” (Jay Pharoah, RIDE ALONG) who suffers a major mishap during a music video shoot. This leaves his boys in emotional disarray and financial straits, resulting in retreat to their shared hometown of Champaign, Illinois. “We never had it all. Lou had it all. We were just kind of there,” reasons Alf to Ronnie while sitting in – gasp! – a mere Midwestern bar and grill. Can they rebound and become the well-rounded adults they never were or will the seductive grasp of “the lifestyle” pull them back in? For good or for ill, they find out quickly that adjustment to their original digs is going to be one giant re-learning curve; those 15 years spent partying, posturing, and jet-setting with Lou since the end of high school do squat to impress their family and friends. Knowing little else, the self-proclaimed “Alonzos of mourning” try hard to shoehorn their hip-hop image and excessive materialism into how they interact with the domesticated surroundings, operating out of a bland two-bedroom apartment and searching for ways to scrape by until a master plan comes together. Created by Jordan Cahan, David Caspe, Daniel Libman, and Matthew Libman, whose total combined efforts have gone into such recent programs as HAPPY ENDINGS, MARRY ME, BLACK MONDAY, and THE MICK, CHAMPAIGN ILL is bent on mining the most “arrested development” humor it can out of Ronnie and Alf’s predicament. The first three episodes, posted for free viewing with the remainder available to Premium subscribers, breeze by at a clip and occasionally dare to dip into dark waters and cringe humor without wallowing in unpleasantness. That said, a rapid-fire preview appearing at the end of Episode 3 promises the Champaign respite will become more outrageous and dangerous as their stay continues. Appearing throughout the season of this “YouTube Original” are veterans Allyce Beasley (MOONLIGHTING), Curtis Armstrong (SUPERNATURAL), and Keith David (NIGHT SCHOOL) as Ron’s parents and Alfonso’s father, comedienne Danielle Schneider (THE HOTWIVES OF ORLANDO) as Ron’s sister Shayna, writer/actor Neil Casey (INSIDE AMY SCHUMER) as Lou’s manager Craig, and Sabrina Revelle (HE’S JUST NOT THAT INTO YOU) as Alfonso’s former flame Courtney. Maurice Marable (BROCKMIRE) directed the first two episodes, “A Gangster Way to Start Your Day” and “Loop de Loop Fastballs,” written by the Libmans, Caspe, and Cahan, while David Katzenberg (THE GOLDBERGS) directed and Danielle Uhlarik (MARY + JANE) wrote the third, “Wowee These Guys are Good!” Sony Pictures Television partnered with YouTube to produce CHAMPAIGN ILL in Atlanta, Georgia, and the half-hour show is expectedly rated TV-MA. Since we viewed the first third of its season, we feel obliged to briefly address whether a program named CHAMPAIGN ILL but filmed in a southern state looks or even feels like the Champaign we know. The answer is, “not really,” and it doesn’t bother us at all. Everything depicted in this shadow version of the Bubbly City is somewhat recognizable as suburban, while there is no obvious attempt to depict anything specific from here as a clever detail or obscure Easter egg. (The one exception in all the footage we’ve seen is Ron’s “IL Lou” sweatshirt in the teaser embedded above, which at first made us think of the former University of Illinois men’s basketball coach Lou Henson with the orange coloring.) Champaign is rarely invoked in dialogue and Urbana goes unmentioned; their influence on this project probably starts and ends with that wordplay in the title, just like the alliterative MIKE & MOLLY once referenced-not-really a former downtown bar. As it stands, CHAMPAIGN ILL is an enjoyable lark (if an acquired taste) that benefits from witty (if profane) scripting and an easy chemistry between Pally and Richardson. p.s. Adam Pally must have learned about Champaign prior to CHAMPAIGN ILL. He starred alongside Zoe Lister-Jones in her acclaimed “married-with-a-band” dramedy, BAND AID, which was her follow-up production to CONSUMED. p.s.2 Two of YouTube’s co-founders and fellow UIUC alumni, Steve Chen and Jawed Karim, must have heard about CHAMPAIGN ILL by now. Right? p.s.3 CHAMPAIGN ILL has a theme song of sorts, IL Lou’s slow churner “Jet Lag” as performed by Jay Pharoah, although it’s only heard at full strength in the first episode. You can add it to a listening list. p.s.4 We’ve found few reviews of CHAMPAIGN ILL. At least Ben Travers of IndieWire likes it. p.s.6 In the first issue of MICRO-FILM, published 20 years ago in late 1999, we covered an independent production filmed in California called PURE KILLJOY because it sounded interesting and had a local connection in producer and uncredited co-screenwriter Lane Soelberg, who regularly jetted between Los Angeles to work on the movie and the C-U to complete his Master’s in business administration at UIUC. The proper titling of this noir-fed mind bender, as seen in its publicity materials, is pURe kILLjoy. It’s a curious observation if you immediately looked at its capital letters. Soelberg did tell us in confidence that “UR” and “ILL” had nothing to do with Urbana; it is actually a sort of portmanteau for “you are ill” in reference to the mental state of the main character, Fred Derf (Gregg Rubin). The movie itself has gone AWOL like so many other Nineties indies. p.s.7 Yes, this is the first of several MICRO-FILM references we’ll make in 2019. WR ILL MF like that. This entry was posted on Thursday, January 17th, 2019 at 1:00 pm	and is filed under Broadcast Dates, Gone Hollywood. You can follow any responses to this entry through the RSS 2.0 feed. Both comments and pings are currently closed. 14 distant relations of Jan Tschichold dissected this page in 0.364 seconds while exacting sweet revenge in silence.